My Kingdom for Cohesive Direction! 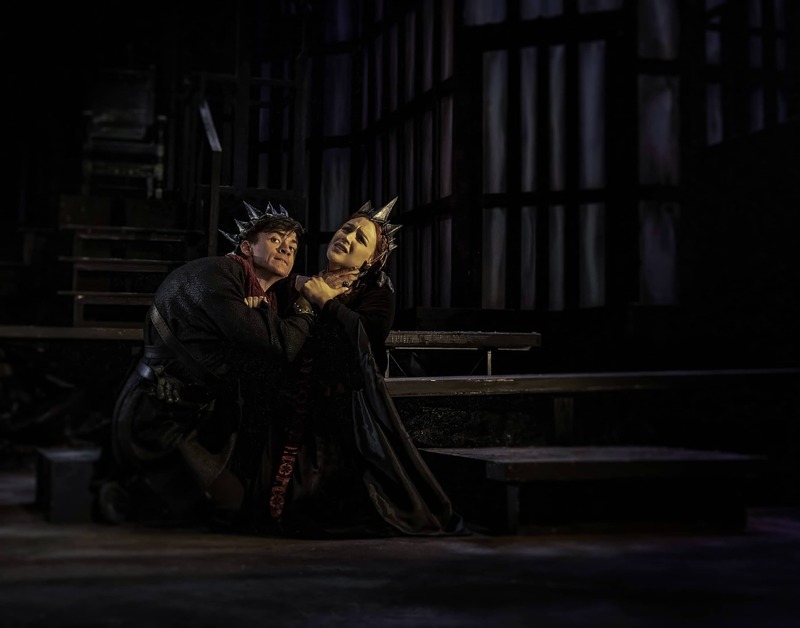 Richard III is one of Shakespeare’s most famous history plays written about the insidious king and his corrupt quest for blood, power, and the throne of England. It’s truly horrifying how relevant Richard III is for today’s audience considering our current political climate. However, the direction by Brent Gibbs, in this Arizona Repertory Theatre production, left me unsatisfied and confused. ‘The blocking of this production was awkward and unmotivated. The performers seemed to be crossing from once side of the stage to the other with no greater reason other than the fact that they were told to. This was especially the case in large crowd scenes. 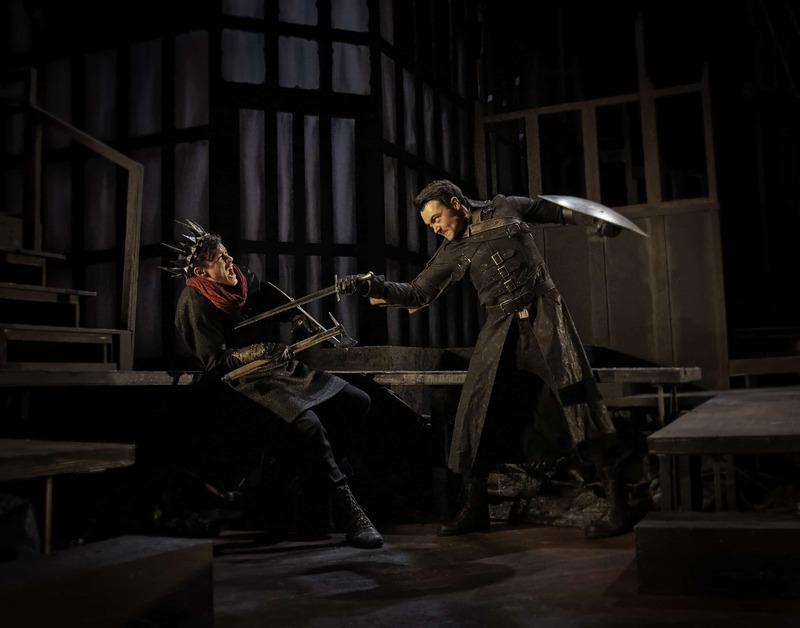 Richard III is a play heavy with death. But this production seemed to have little to no stakes from characters who were being sent to their executions. There was no sense of danger associated with many of the character’s deaths, and ultimately it didn’t support the content of the play. The world just wasn’t believable and this made the two-hour production difficult to sit through, even for a Shakespeare-lover such as myself. To top it off, director Gibbs chose to create an out of left-field alternate horror movie ending which completely strays from the original text. This left me wondering, will there be a sequel? If so, count me out. Through all of the awkward staging, lack of relationships, and bold directorial choices there were some notable performances. Liam Thibeault’s Duke of Buckingham was witty and sharp, Kelly Hajek’s Queen Elizabeth was strong and striking, Jenna Meadow’s as the Murder was hilarious, Marina DeVaux and Sophia Goodin as Edward and Duke of York were unified and clear. Overall I felt that the female ensemble members carried the show. They were dynamic and interesting to watch on stage. As for Connor Mckinley Griffin’s portrayal of the title character, I felt that his lack of charm presented the character as one dimensional. Griffin delivered plenty of horrifying menace, but I wish that his Richard had a little more depth in his villainy. In spite of all the production’s directional bumps, visually this play was stunning with a multi-leveled set by Jason Jamerson adorned with spikes, skeletons, and abstract metal work. The lighting by Tori Mays was striking and helped set the scene. The costumes by Elizabeth Eaton were gorgeously grungy. This production was a technically and visually jaw dropping, and the production is worth witnessing for the design elements alone. However, the production design team could not save the show from its misguided direction. Richard III is playing at the Marroney Theater through Sunday, March 31st. Tickets can be purchased via the Arizona Repertory Theatre website: theatre.arizona.edu or by calling the box office at 520-621-1162. Caryl Churchill’s Top Girls is a big play. Big personalities, big themes, big scenes. David Morden directs Arizona Repertory Theatre’s production deftly, and while the production has weak moments, this cast does an impressive job juggling a complex web of characters, navigating difficult dialogue rhythms, and bringing the evening to a harrowing climax. The play opens with a challenging scene, where the central character Marlene, played by Rebecca Galcik, hosts a dreamlike dinner party for six women from history. Some are real historical figures, some are characters from folklore, but all arrive with stories to tell. Churchill writes the scene to be fast-paced, with many lines overlapping, as the women discuss their relationships with men and children, their adventures around the world, and their thoughts on religion and philosophy. It is a feast for anyone who has yearned for the advice and wit of those who have gone before us. Given the pacing, the larger than life personalities, the odd theatrical conceit, the difficult subject material, and the four different dialects used onstage, this is an extremely difficult scene to pull off, and a few moments were lost in the shuffle. As someone unfamiliar with the play, the scene was somewhat hard to follow, and I wished Morden had encouraged a slower pace and more demonstrative blocking where possible, especially near the beginning of the scene. The remaining scenes of the play, however, are worth the wait. The play shifts time, place, and theatrical style, and we get a glimpse into Marlene’s life as a successful businesswoman, and the challenges that come with being a woman at the top. Six of the seven actors play entirely new characters, some of them multiple new characters, and Morden’s casting is masterful. Each actor slips into the skin of someone new, while retaining thematic vestiges of the dinner party scene. Elana Richardson’s Pope Joan character transforms into Joyce, the working class sister of Marlene. Richardson remains stoic, like her papal counterpart from scene one, but adds a downtrodden jadedness more appropriate for Joyce’s socio-economic situation. Eavan Clare Brunswick portrays the Scottish explorer Isabella Bird in the first scene with a proud earthiness, and later becomes Mrs. Kidd, a woman who tries to protect her husband’s job by desperately attempting to unseat Marlene from her high-powered position. While the earthiness of Isabella vanishes, the boldness and sense of pride remains. It was a joy to watch these shape-shifting women command the stage with ever more nuanced performances. Perhaps the most exciting transformation is in the hands of Maggie McNeil. She arrives at the dinner party as the folkloric Dull Gret, a nearly-mute spud of a woman dressed in battle armor, who seems primarily concerned with getting more to eat. McNeil, with few lines, becomes a highlight of the scene, radiating with childlike curiosity and coarse table manners. The scene ends with an engrossing description of Gret’s brutish invasion of hell. In the following scenes, McNeil plays the devilish teenager Angie, who resents Joyce’s tough love approach to parenting. She captures the feverish energy of teen life without too much wackiness. McNeil’s Angie is magnetic, radiant, and frightening. McNeil plays two characters whose humanity is interrupted by violence, and she strikes that balance beautifully. The final scene of the play between Marlene and Joyce is also stunning. Galcik and Richardson know this scene inside and out. The two sisters argue over the central problem of the play—Angie is really Marlene’s child, but was raised by Joyce. The two navigate the would-have, could-haves of their past, unearthing resentments and illustrating the nearly impossible situation that Womanhood has put them in. Their dialogue flows like a river, hitting high points and low points, splashing against barriers and overflowing with rising tension. The two perform the scene with an excellent handle on the rhythms of the language and the vulnerability of their characters. A word on the technical elements of this piece. Allison Morones has a huge job costuming 7 actors as 16 characters, all of whom change clothes, and most of whom change hairstyle. With few missteps, the costumes fit seamlessly into their world. Even the myriad wigs, which can be distracting if not used well, are consistent in their strangeness. They function similarly to masks in this production, giving a tongue-in-cheek nod to the double-casting in the play. Additionally, director David Morden achieves an almost impossible feat of coaching at least four dialects, ranging from Scottish to Japanese. While some actors handled dialect more naturally than others (Eavan Clare Brunswick has executed 3 different dialects this season, all masterfully), I was impressed with the consistency and range of dialects onstage. I want to take a moment to praise ART for producing not one but two plays this season with all-female casts. The technical and design team for Top Girls is also a majority of women. It is empowering to watch women hold space onstage for an entire evening, and it gives female artists a chance to work together in ways that are rare in the performing arts. At the same time, I wish the University had more female directors. While I applaud Morden’s work on Top Girls, it also occurred to me that white men will direct almost all the main stage productions at ART this season. I hope that the University will consider diversifying their staff, especially when it comes to faculty with directing qualifications. Top Girls runs at Arizona Repertory Theatre through Sunday, February 24th. Tickets are available online through the ART box office: 520-621-1162 or theatre.arizona.edu. 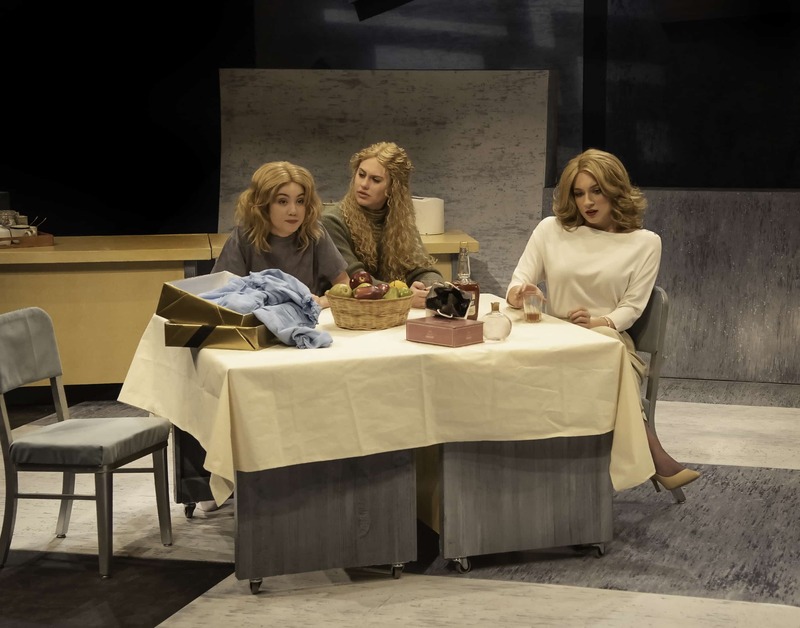 Editor’s Note: While Holly is an adjunct instructor in the School of Theatre, Film, and Television, she has no relationship with any students involved in Top Girls, personally or professionally. Additionally, Holly has worked professionally with David Morden. While this does not impact how a performance is reviewed, we feel it is important to disclose any potential biases. Dylan Cotter as Billy, Connor Griffin as Bartley and Rachel Franke as Helen. Photo by Ed Flores, courtesy of Arizona Repertory Theatre. Arizona Repertory Theatre’s most recent production, Martin McDonagh’s The Cripple of Inishmaan, upholds a level of professionalism common at the University of Arizona. The production is seamless and consistent, true to the story, and well-acted. Directed by Hank Stratton, the play follows the orphaned Billy, who lives with his adoptive aunts on the island of Inishmaan off the West coast of Ireland. Walking with a “shuffle” and a disfigured arm, Billy yearns to escape the constant ridicule of his community and formulates a plan to leave the island. The play has all the signature elements of Irish drama–quick wit, mystery, dark humor, and colorful family dynamics. The company is unshakably gelled. All the actors inhabit the same world, and there is a consistency of rhythm and intensity between scenes. Dylan Cotter’s performance as Billy is nuanced and heart-wrenching. We feel his pain, hope for his triumph, but see a darker side when he manipulates his friends and caretakers. Elana Richardson as Eileen, Billy’s aunt and caretaker, is also outstanding. She plays the role with a strong backbone and a sharp wit. Eileen is a pillar of the play, unshakable in her dedication to Billy but simmering over a flame of maternal worry. This is a difficult balance to strike, and Richardson does it masterfully. Other outstanding performances include Rachel Franke as the delightfully profane Helen and Connor McKinley Griffin as Bartley, her clownish brother. Franke has a particularly tough job. Helen is simultaneously confident in her sexuality and traumatized by it. We learn early that she has been groped and harassed frequently by older men. In typical Irish fashion, she copes with her experiences using humor, but with Franke’s performance, we sense an undercurrent of anger. The whole cast frames up McDonagh’s sharp humor with surprising skill. The quick-witted sarcasm, the dark comedy, and the incessant needling are all there. I laughed aloud often. Still, I felt there was room in Stratton’s direction to dial up the almost inhuman absurdity of some of the personalities in McDonagh’s play. Part of the irony of The Cripple of Inishmaan is that most of the characters are uglier, more disabled, and more grotesque than Billy. They all have “crutches” of one kind or another, they all have internal disfigurements and moral injuries. The flaws of these characters are larger-than-life and should balance on the edge of difficult-to-watch. Pateen Mike’s jovial cruelty, Babby Bobby’s brutal temper, Doctor McSharry’s misogyny, Helen’s unabashed naughtiness, Aunt Kate and Aunt Eileen’s quaking nervousness should make Billy’s world unbearably claustrophobic. These characters are rough. They are cruel. They are damaged. I’d like to see this cast do the play with a blazing intensity. Each actor already gives their character the proper flavor, but I wish Stratton had encouraged the cast to turn up the volume. I think this approach would pull the connective tissues of the play even tighter, making the funny moments funnier and the dark moments darker. Michael Schulz as BabbyBobby, Peter James Albert Martineau as JohnnyPateenMike and Dylan Cotter as Billy. Photo by Ed Flores, courtesy of Arizona Repertory Theatre. Still, this cast does a solid job with a difficult play, and the production elements all communicate with each other to paint a believable picture of humble, mid-century life in rural Ireland. Kevin Black’s dialect coaching is excellent. Actors sound consistent yet still individual, and the cadence of the dialect is rough enough to give us the flavor of the remote Aran Islands without sacrificing our ability to understand every word. Joe C. Clug’s scenic design effectively shows the drab interior of the Aunties’ store, designed to be quite literally rough around the edges. Gaby Nava’s costumes were perfectly Irish with hearty fabrics and muted colors, plus a bright magenta dress that popped on the promiscuous Helen. Fans of dark comedy, poetry, and Irish storytelling won’t want to miss it! The Cripple of Inishmaan runs at Arizona Repertory Theatre through December 2nd. Thursday, Friday, and Saturday nights at 7:30; Saturday and Sunday afternoons at 1:30. You can buy tickets online at theatre.arizona.edu or by calling 621-1162. Editor’s Note: Holly Griffith an adjunct instructor in the Department of Theatre, Film and Television at the U of A. While she had no input or involvement with the creative process for this production nor is a professor to any of the students involved in this production, we feel it is important to disclose any potential biases.